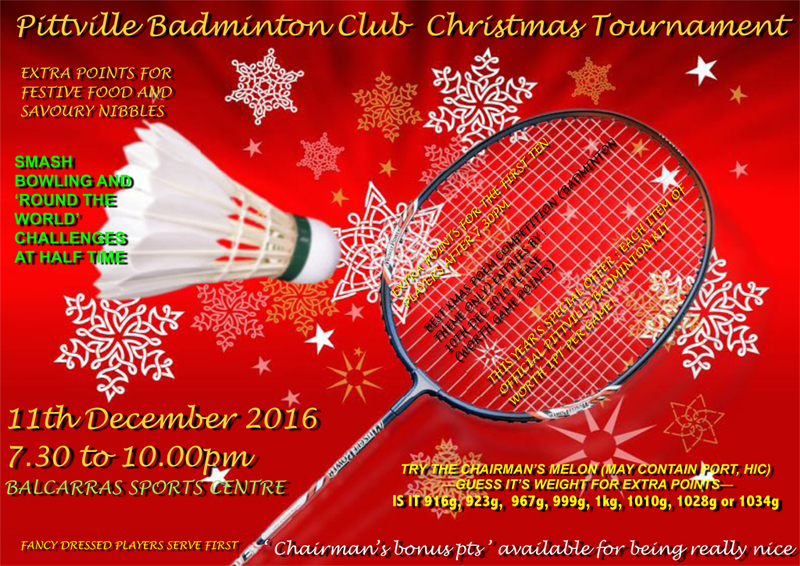 It’s Christmasssssssss (soon) and that means it's time for our Christmas Tournament. I hope you have all remembered to reply to Chris' email so we know how many are coming. This helps us to organise the tournament format in advance. This year, the Tournament will be held at Balcarras Sports Centre, with four courts, so there will be an opportunity to play lots of games. Please give some thought to what you would like to bring: food or non-alcoholic drink. We need a bit of both! Not too much though. I will bring to club night tomorrow a sheet of paper so you can all write down what you would like to bring but without duplicating. If you can’t make club night tomorrow, just email me. If any of you have any food allergies please let us know.